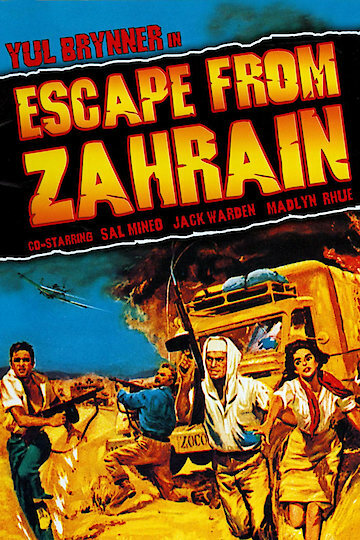 "Escape from Zahrain" (1962) is an American action film set in a fictitious country in the Arabian Peninsula, the titular Zahrain. The film is about a group of condemned prisoners who are fleeing across the desert in order to seek sanctuary at the Protectorate of Aden (present-day Yemen) which is run by the British. The prisoners are an eclectic mix of nationalities and include an Arab revolutionary, an American oil worker, and a British agent. It is based on a novel called "Appointment in Zahrain." Escape from Zahrain is currently available to watch and stream, buy on demand at Amazon, Vudu, iTunes, YouTube VOD online.